One of the sounds I love best about summer is the tootling of the House Finches. 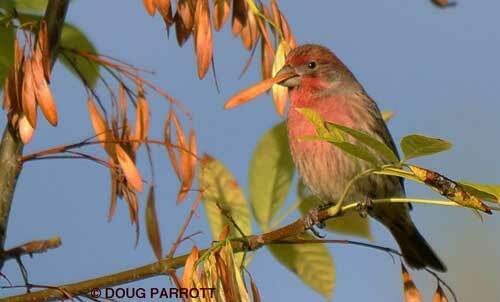 House Finches are the quintessential LLB (little brown bird). The females and juveniles are a nondescript combo of muted brown and beige stripes that allows them to simply vanish from view whenever they hop onto an equally brown and beige branch. The males have a little red here and there, but somehow it all blends into the browns and disappears from notice. I’ve sat in front of blackberry bushes knowing a House Finch was mere feet from my face, and yet I couldn’t pick it out from the foliage. Other times, I’ve seen one or two in a bush, and then they get startled by something, and a bazillion fly out, like clowns exiting the Clown Car at a circus. They were obviously perching in plain sight all the time, but their nondescription hid them like magic. What the House Finches lack in appearance, though, they make up for in song. House Finches have one of the most complex, beautiful songs in all of bird-dom. In spring, the males give concerts that go on and on, never seeming to repeat themselves. Not tuneful, exactly, since I can never quite identify a pattern; more like an improvised operatic run, when the tenor takes one note from the score and won’t let go of the spotlight for long minutes at a time. Now that it’s summer, the males have mostly stopped singing. Instead, they and their families are tootling. It’s a musical conversation they carry on with each other, and it is lovely. I guess they just can’t help singing, even when they’re only passing idle comments. It’s this trait of House Finches that appeals to me the most because it reminds me it’s what you do in life that matters, not what you look like. This entry was posted in Uncategorized on July 8, 2010 by constancesidles.